The heartbreaking truth about animal shelters is that when they get too crowded, some of the animals have to be put down. But for one ill-fated puppy named Rudolph, destiny had another plan. Rudolph is an adorable black mixed pit-bull puppy who was brought up in an animal shelter. Apparently, no one took an interest in Rudolph within the first seven months of his life. Meanwhile, the shelter continued taking animals and eventually there wasn’t any more room for Rudolph. The shelter’s vet was tasked with euthanizing Rudolph and went through with the procedure. “But God had a different plan because [Rudolph] woke up. And thank goodness the vet said he wouldn’t do it again,” wrote Kings Harvest Pet Rescue in Davenport, Iowa. 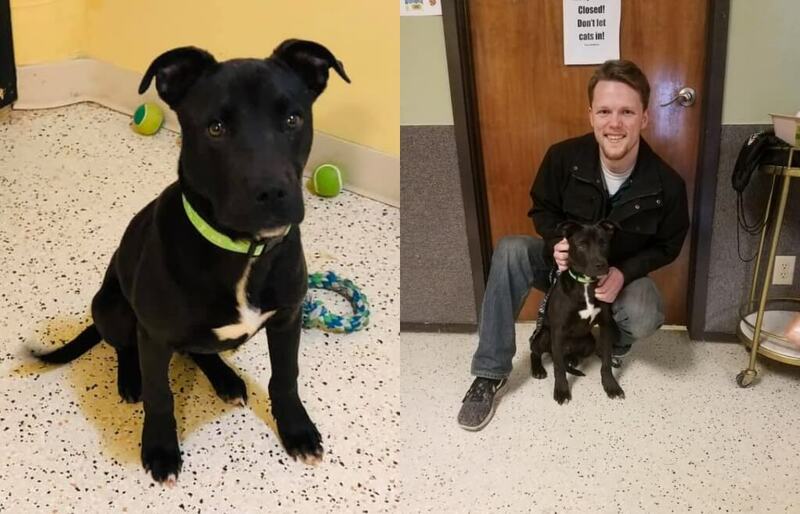 After the vet decided not to test fate a second time, Rudolph was taken in by Kings Harvest, who shared the pup’s miraculous story on their Facebook page. The post generated so much interest that Kings Harvest was flooded with applications to adopt Rudolph. In a matter of days, Rudolph was finally blessed with a forever home. “It was a tough decision with so many wonderful applications but Rudolph fell in love with this young man and the feeling was mutual,” Kings Harvest wrote next to a photo of Rudolph with his new owner. While Rudolph was clearly given a second chance at life, it’s a wonder how it even happened. “Euthanasia is usually just an overdose of anesthetic. You have to hit the vein and you have to make sure you give enough. It could have been a combination of missing the right spot or not giving enough, so that he just went to sleep and woke up,” Rochelle Dougall, assistant director of Kings Harvest, told NBC News.